Later this year, Habitat for Humanity of St. Charles County officials and volunteers will trade in their hammers and hard hats and celebrate the completion of a new home. The Cuivre River Electric Community Trust will have played a role when they keys are passed to the new homeowners. 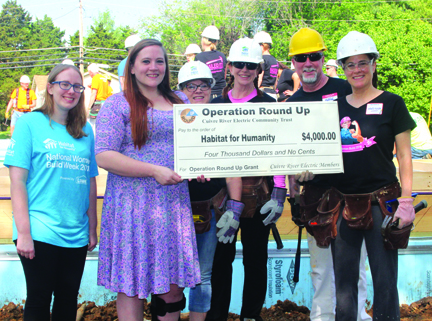 In May, Habitat St. Charles was awarded a $4,000 Operation Round Up grant from the Trust Board to help provide an energy-efficient HVAC system in the home. This is the 83rd home built by Habitat St. Charles since its inception in 1997. Over that time, the organization has received more than $54,000 in Operation Round Up funds. “We thank Cuivre River Electric for the continuous support,” said Lauren Grotegeers, who helps raise funds for Habitat St. Charles. The two-story home is being built at 510 Wall St. in Wentzville. Construction began in May and is expected to be complete in six to eight months. Habitat officials anticipate the family, consisting of two sisters who are raising their six grandchildren, to be moved in by Christmas. The two-story home will have five bedrooms and two bathrooms. The overall project cost is $140,000. Habitat St. Charles continues to make home ownership a reality thanks to its generous donors, volunteers and other supporters. To be eligible for consideration, families must live or work in St. Charles County for one year at the time of application and be in need of safe and affordable housing. Individuals and families must meet income requirements, have a willingness to partner with Habitat St. Charles and complete 350 “sweat equity” hours. While families help build their new homes, many don’t realize they are also responsible for paying the mortgage after they move in. In addition, Habitat St. Charles offers financial management classes and home maintenance workshops to help prepare families for home ownership. To learn more about Habitat St. Charles, visit www.habitatstcharles.org or call 636-978-5712. Operation Round Up grant funds come from Cuivre River Electric Cooperative members who voluntarily pay the round up amount on their monthly electric bill. The funds are administered by volunteer trustees who represent areas within St. Charles, Lincoln, Warren and Pike counties where Cuivre River offers electric service. and Melissa Hollander, Cuivre River Electric Community Trust board member.